The door windows have an outer seal that is supposed to keep water from dripping into the inner of the door and causing oxidation. 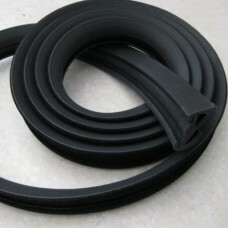 The rubber gets hard and stiff, the seal does not work anymore and bits of sand tend to get stuck between the glass and rubber causing scratches. A new seal is required. Porsche supplies new seals but at enormous cost. This offer is for a set of seals to replace the left and right outer scraper seal. It is an aftermarket version of the original, not pre-formed but it can be inserted nicely without any problems. The rubber is a lot softer and the soft inner side felt helps closing the gap between glass and seal. A good alternative for 1/3 of the factory price. Part fits all models. An instruction video can be provided.